Just over two weeks ago, Paramaribo SPAN posted information on Dutch artist Arnold Schalks's Someni Tongo project (2008), which examined Suriname's cultural and linguistic diversity through a live performance of a celebrated poem. The comments left on the original post raised interesting questions about how this and other art projects are (or could or should be) received and interpreted by audiences and the wider art community. Writer Chandra van Binnendijk, who witnessed the live performance of Someni Tongo, offers her personal response to the project and the resulting discussion. I was one of the handful of people on that early Sunday morning in the Palmentuin nine months ago, there to watch the performance of Someni Tongo. There was a kind of silent conspiracy-like feeling, for being together for the event. The ones with cameras wanted to take pictures, but the best angle near the podium was not approachable: a vagrant had left a fresh turd right in that spot. And the manager of the Palmentuin refused to clean it up, for this was not his duty, he said. It did not bother us at all: we placed an old newspaper on top of it, we warned others not to step on it, we moved around a little until everyone found his best place around the podium, and then we watched and experienced and enjoyed the Someni Tongo performance. All those tongues, speaking in all those different languages, expressing the same lines -- it was special, it was beautiful, and more so because we were there for the live experience. The audience that morning left the Palmentuin with a feeling of upliftment, of contentment. Shouldn't a similar feeling of contentment remain with the one who created this beautiful experience? What happens to the artist when he is so attached to the fruit of his work that he feels disappointed when response and feedback from the public are not what he expects (or even feels he deserved)? When he is not praised or imitated? Where is the pure joy of creating? I think art is exactly and only about this: the need to create and express what is uniquely inside you, and to do so because you have no choice. Something is envisioned, it wants to come into the world through you, and it can only be born through your effort. Full stop. No ulterior motives. Creation is making art -- not the aftermath. Someni Tongo was beautiful. But in its significance it was not unprecedented. 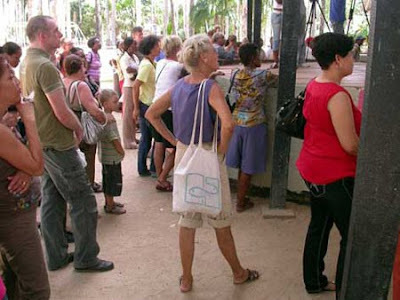 Over the years, Suriname has seen high-level performances of multi-racial, muli-ethnic, and multi-lingual performances. One example is the theatrical production Rebirth, by director Henk Tjon, which was presented at Carifesta 1981 in Barbados, with a dazzling combination and integration of all these aspects. There have been performances by the National Ballet of Suriname choreographed by Ilse-Marie Hajary, who created the Dogla style, in which she integrated Afro drumming and winti elements with classical Indian dance movements. So multi-culti is not really new for us. One should not overlook history -- we are able to reach heights because we are standing on the shoulders of those before us. Tjon and Hajary were not greeted with lavish standing ovations -- their work was not understood at first. This takes time. On that beautiful mormning in the Palmentuin, we did not let the turd disturb us. Because the performance was compelling. The experience was enough. Art in itself is enough. Surinamers don't get much choice about transculturalism, given the nature of a country with so few people and so many ethnic categories. That is, I think, Dobru's point in the poem, and any way that it can be made by performance is valid.